Actress Gong Seung Yeon was spotted cheering on her younger sister Jung Yeon from the audience on the latest episode of Sixteen. On the June 30 broadcast of Sixteen, Mnet′s girl group debut project with JYP, the remaining members, including Jung Yeon, shared their thoughts before taking the stage for the final mission. Jung Yeon said, "I will do my best as it′s my final performance, so please look on favorably. I really want to join the major team and debut." The camera then panned to her older sister and actress Gong Seung Yeon, who was cheering from the audience. Gong Seung Yeon recently wrapped up SBS′ I Heard it Through the Grapevine and is starring in MBC′s We Got Married. Meanwhile, the participants on Sixteen are vying for a spot in JYP′s next girl group Twice. The filming was held last week and family from all contestant came to support. We Got Married actress Gong Seung Yeon modeled Palladium sneakers for the July issue of Oh Boy! Magazine. The rising star mainly presented rain boots and lace-ups from a limited-edition collection that will be exclusively available in Asia. Fortunately, some of the designs Gong posed with are available online at the brand's English store! For instance, the beauty coupled a pair of striped American Apparel shorts and a loose midnight blue t-shirt with the "Baggy M" sneakers. According to the brand, "Enjoy two great style looks with the Baggy. Worn collar up or down, this boot features cotton canvas for the upper and lining featuring the must-have pastel shades of the season. The EVA-cushioned footbed and hugging heel cup cradle the foot for lasting support." The orange pair can be yours here in the online store and can be seen below in greater detail. Gong also presented the "Puddlelite" polka-dot sneakers. The shoes can be yours here at Rakuten Global Market and can be seen below in greater detail. Recently, Gong has been participating in a stream of magazine pictorials. She had an amusement-park themed photoshoot for the June issue of InStyle and posed with her We Got Married husband Lee Jonghyun in the June issue of Ceci. Actor Yeo Jin Goo recently sent his message of congratulations to on-screen couple CNBLUE’s Lee Jong Hyun and actress Gong Seung Yeon. The July 11 broadcast of MBC’s “We Got Married” followed Lee Jong Hyun and Gong Seung Yeon to the scene of their wedding ceremony. Before the wedding, Gong Seung Yeon asked her virtual husband, “Who is coming as a guest?” to which he firmly responded, “There are no guys,” causing laughter. Putting aside his feelings of jealousy, however, he shared a video message from the actor that he prepared for his wife. It is unexpected for new actress GSY to be part of MBC’s WGM. This was because up till then, GSY was a little known and even unfamiliar face. Having started her virtual marriage with Idol Group CN Blue’s LJH with worry, her appearance has now sparked the audiences’ curiosity, and earned their warm support. Just like that the many people shared their first impressions of GSY through WGM. While being part of WGM, GSY was also part of Temptation’s Director Pan’s hyped piece “I heard it through the grapevine” (IHITTG) where she had the role of an aspiring announcer, while bringing to life her role she had also gained a lot more recognition. Being part of both well-talked about variety program and TV drama, inevitably misunderstandings arose. With regards to this, GSY says, “ people may possibly think that one day I just dropped from the sky, since I appear not only in IHITTG, but also in WGM. In reality, I had actually failed up to a hundred auditions, and prepared hard to be where I am now. Towards those misunderstandings, it’s upsetting”. She gave a smile while explaining. If one just looks at the result and not the process, it is possible to come that conclusion. But GSY had auditioned for all the currently airing broadcasts, running around for the auditions. To have the opportunity to be part of HITTG, rather than saying it was unexpected, she had only wanted to present herself as she was and was unable to express all she wanted to say, she took out that letter she had prepared. “HITTG is a piece that gave me a lot of opportunities. I heard that upcoming piece, Six Flying Dragon’s Director Shim liked to watch HITTG, so he said to Director Pan, ‘I want to meet that person’, and so I was able to audition for it. It was fascinating. Also, I heard my calligraphy (懲毖錄) is left untouched in the KBS office. I was thinking, although I did not make it through the audition, will he still remember me?” GSY was explaining while recalling events a while back. For a newbie to be part of a variety program there were a lot of extreme resentments, even to be a fixed cast it can be said that it was a blessing. With regards to discovering GSY the WGM PD Sun explained, “she gave off very natural vibes just like a female college student and possessed a mysterious charm” and so she was selected. Director Ahn also said that, “because she is not like the 20-somethings nowadays but very easy going and kind so I chose her”. They both agree on her charms. The GSY that the editors interviewed was natural while possessing a unique charm, a rising star to look out for in the future. GSY’s star potential was first discovered as early as 10 years ago. 10 years ago, when SY was in elementary school grade 6 she was approached by SM entertainment while on the road. Having been selected for the first place in “SM’s best competition” as “best visual”, she had spent 7 years in the trainee program where she learnt the basics of singing, dancing, performance, and also languages, broadcasting, rapping and modeling through various lessons, and pursued her dream. Her name had appeared repeatedly in the fan created list of girl group names expected to debut, this was also degree of expectations that people had for her. There were also people who debuted in girl groups, and carried out their idol activities and (drama) performing simultaneously, when asked if she couldn't have done it that way, and if she regrets or has mixed feelings leaving a big entertainment company and their wide resources and connections are questions she hears often, but GSY responds with a “I no longer have any infatuations with being a singer” revealing her unwavering beliefs. Another fact to note is that GSY’s youngest sister Jung Yeon are fast becoming a pair of sisters that draws attention in the entertainment industry. Jung Yeon is now part of JYP’s survival program to select the next girl group, “Sixteen”. Having a completely different charm from her sister, she is earning a lot of attention for being a girl crush. They both moved from their home in Suwon to live in Seoul, and GSY revealed, “This week we saw ‘Sixteen’ together, because her friend was eliminated my sister cried. I was also very upset”, expressing feelings of regret. Even though it is such, she is relieved with Jung Yeon’s popularity, and says that she is “really thankful” despite the frequent movement between groups and starts to be proud about her sister. “Because Jung Yeon was really worried for me, she told me not to watch. But rather than being worried, because every one is really good to her I am really happy about it. Actually we did not expect that she would top the polls. Through the program I first came to see Jung Yeon’s leadership potential. At home she really is the maknae with a lot of aegyo”. Rather judging too soon, GSY is a newbie that can be excited for and expected. When “Seo Neori/GSY” nameplate for her position appeared at the first script reading for HITTG, I had the thought “I finally found this drama” and found it fascinating. 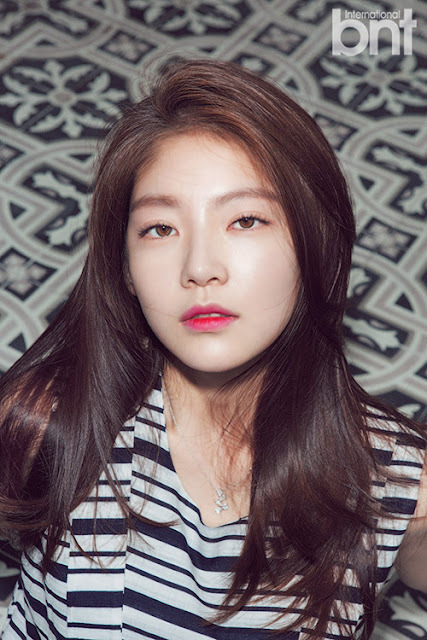 When transiting to become an actor, she had changed her surname from her real name Yoo Seung Yeon to Gong Seung Yeon, for her stage name. This was because she wanted to put aside her past experiences and its tendency to temporarily stir up a topic, and her belief to focus on her ability and give it a shot. She will stand under camera lights once again through the upcoming drama expected for first broadcast in October, Six Flying Dragons as Lee Bang Won’s wife, to play the character of Empress Yuan, and this is a recognition of her real ability. “ Because I am playing a character that actually existed before, so I am currently studying history. The tone for a saeguk is hard to grasp so I am worrying about that. I will also present a side that I have not presented so far, so please be expectant for that”. Even though HITTG has come to an end, and although she had a small role but continually showed her potential, when is the next time we can be excited for her? She wants to be “an actor with rich inner character, an actor with good acting as someone who is able to share her unique fragrance”. We hope that GSY will be able to realize her wish soon. Without a new face in the drama scene, she was as timely as rainfall. In the entertainment industry, she goes by the title of “ discovered treasure after a long while”. She is GSY (22 years old) who was part of the recently completed SBS drama I Heard It Through the Grapevine (HIITTG) and WGM. While being part of SBS’s highly anticipated end year historical drama, Six Flying Dragons (SFD), SY was added to the cast very early on, and is earning a lot of attention. But just 5 months ago, much less the name GSY, she was an unrecognized rookie, but now she has become “the most anticipated rookie of the year”. “Its fascinating! I had once earnestly prayed that I would be able to get to work, and now when I walk on the streets, upon seeing me Ahjummas will say ‘Good job!’ and give me a lot of compliments, being recognized by the public makes me feel like my dream has come true”. It appears like she is a celebrity that came into the public eye because she was lucky, but actually behind this was 7 long years of hard work and suffering. Although once a trainee in SM entertainment, she harbored dreams of being an actress and decided to start from the very beginning. There after, she had numerous failed auditions, but it didn't dilute her passion. She once thought, “Am I unlucky?” and “Is this the path I should be walking on?. But in 2012, she unexpectedly participated in the cable drama “I love Lee Tae-ri”, and thereafter became unable to give up her dream. “There was no way I could forget the energy and atmosphere of the filming site, and the staff members bustling around”. She held close her numerous failed auditions and experiences, and admits that compared to other rookies who do not even have the chance to audition, she is lucky, and effort is always rewarded with time, her skills are getting better slowly. GSY’s charm is clearly seen in WGM and the selection process for Six Flying Dragons. WGM was seeking change, and among the fresh rookies, discovered SY’s CV among the list of new female actresses. It was similar with SFD. Director Shim saw that SY was a fresh face in HITTG, and gave her an opportunity, to be casted in the drama as the role of Emperor Lee Bang Won’s wife, Empress Yuan. One day in HITTG, Senior Jang Hyun-sung suddenly congratulated me, at that time I did not know the reason. As an acquaintance of Director Shim, Senior Jang had known of the news beforehand, and so he offered his congratulations, and said that Director Shim found a fresh new face. Although faced difficulty SY had earned her chance, and being part of a historical drama is burdensome for a new actress but she is unafraid. Now she is just beginning to gain attention, if there is discussion about her acting poorly, her previous efforts may all be wasted. “ It is an important timing, the writer said ‘You must do well’, and this made me nervous. About Empress Yuan, I first thought of Senior Choi Ming Ji’s well-received performance in Tears of the Dragon. There is bound to be comparison. And so I have been practicing the tone for saeguks, and also learning history. It is really difficult! Although it is difficult material for a rookie, and the pressure is huge, but just like how I managed to first come to earn the public’s interest, I will do my best and present my best self to everyone”. GSY would be one who is a successful person in whatever she does. Completing 7 years as a trainee and successfully transitioning to become an actor, 4 years later she has become a newbie in the drama scene and is catching the two rabbits of drama and variety at the same time. The following is a Q&A with GSY, a fresh face, who was introduced to the public through SBS drama I Heard It Through The Grapevine (HITTG) and MBC Variety We Got Married (WGM). As an actor, it was a piece that showed me how I should proceed from here on, so it is really meaningful. During the filming period, I learnt a lot from the director, seniors and colleagues. I could have done much better, it’s regretful. - What do you think about the character of Seo Neori. Growing up in a family with hardship, she wanted to gain success through her aspirations as an announcer, and wanted to ace and was a woman with strong greed. Having seen her sister in the drama marrying into an upper class family, it stirred up her greed because she had missed out. In reality, although I do have greed but I am not the kind to do more to be able to have more things, so I tried to understand Neori’s mindset. - What if you meet the same kind of circumstances as Seo Neori? Although it is possible that I may be wavered by temptation, but I will get clear-headed quickly and find a sure way to proceed. Towards the latter half of the drama, I am satisfied with the way that Neori while pursuing her dreams had also communicated with her family and so things were harmonious. - How was the pairing between your sister in the drama Go Ah-Sung? Although I am the same age as Ah-Sung, I was impressed with the way she concentrated and focused the moment she is performing. She is someone with responsibility, and a friend that I can learn a lot from if I want to do better in a lot of ways. When I see her perform, I also have firm thoughts of ‘ I need to work hard as well’, and it seems like my performance is also enhanced. - There are a lot of Seniors. “ That was another reason to love the filming site. Even on days I don’t have a filming schedule, in order to watch Senior Yoo Joon Sang and Senior Yoo Ho Jung’s performances I went to the site. I sat in front of the monitor and watched the whole day. I also learnt a lot from Senior Kim Jin Ae who acted as my mother in the drama. - Do you feel your popularity? My cousin in the army said that my in the army my popularity is high. Senior Jang Hyun Sung’s nephew is also a soldier, and said that in the army I am a huge influence, so I know the state of my popularity. Also while I was having a meal in the hotel, someone called me Bom’s sister, and gave me an additional fried egg, I think maybe I was recognized. - You were an SM trainee. In elementary school, I was spotted during an gayageum competition and so I became a trainee thereafter. In 2012, I took part in the tvN drama “I Love Lee Tae-ri” and so thereafter I realized the joy of performing. I ended my life as a trainee and put my effort into preparing to become an actor. - Which group would you have debuted if you debuted under SM? Hard to say but possibly a member of Red Velvet. But I have no infatuations towards becoming a singer. An actor can also become a singer, isn’t it? - You’re also gaining attention as a pair of celebrity sisters. My sister Yoo Jung Yeon, is now part of JYP entertainment produced Mnet ‘Sixteen’. Unlike me she is now working hard towards her dream of becoming an artist. The moment my sister entered the company till now we have relied on and encouraged one another. Also because we moved out from our family home in Suwon, to live by ourselves in Seoul so our friendship is also strong. - What is your father’s reaction towards having two daughters that are entertainers? They feel that it is a pity because I was a trainee for so long. Being able to see their two daughters regularly on tv, it seems that mom and dad are proud. - The reaction towards MBC’s WGM is also really good. Since young I had a dream of getting married the moment I turned 20. Now it is also my goal to get married in my 20s, haha. I thought if it is not now, when will I get a chance to have a experience of married life, having a foretaste of it is not a bad thing, so I decided to be part of it. My husband now is also really good, and I feel contented, its almost like I really got married. Hahaha”. - What are your upcoming plans? I am scheduled to be part of the SBS historical drama, Six Flying Dragons, broadcasting in October, as Lee Bang Won’s wife Empress Yuan. Although it is a Saeguk, but she is a capable and fiery woman. The way I wish to perform and the way I actually perform when compared is really lacking. Here on, I want to work harder and become an actor with a lot of colour. *one of my personal favorites of SY interviews, enjoy! for her last question, I was like "?? you're not serious...on..horror haha". love her! Some people see her as a celebrity that shot to fame. From SBS drama HITTG to MBC variety program WGM, some people have also said being part of a well-received television drama and a variety program that casts the hottest and most popular stars, she is only receiving attention because of the luck she had with her unexpected appearance. Yet for 7 whole years, GSY had spent her teenage years completely and entirely in a big entertainment company as a trainee, and experienced a period of relatively long time training. Going through 2 auditions a day, for over several hundred auditions did she finally manage to secure HITTG and WGM and achieve the simultaneous result and pull, concretizing her position at the top of the most anticipated rookies this year. Revealing a child-like smile while walking into the photo studio, compared to her role of Seo Neo-ri in HITTG who struggles between reality and ideal, GSY is more reserved, but at the same time she appears to be full of inner determination and is resolute and bold. Q: Your first long drama HITTG has concluded its run with good reviews. A: We started during the winter, now that it has ended its almost summer. The first time I entered the studio, it was icy and cold, unknowingly 3 seasons went by. It wasn’t easy to go through each step in the process, but having seen seniors and juniors who when met with unprecedented circumstances were unaffected, I think I learnt a lot. Q: Like other characters in HITTG, Seo Neori is a character that changed a lot during the first part and towards the end. A: In the beginning, Neo-ri’s was very uneasy inside. I think she is similar to the average 20-something, there are a lot of ways that it cuts both ways. Reaching the core point(of the drama), would also result in finding the moment of Neo-ri’s change. The lines from other people always said, “Neo-ri, when are you going to become more sensible?’ towards the latter part it seems she started to present a more mature side. I also made a lot of comparisons between myself and her, and as Neo-ri I also started to reflect. From another perspective, it can also be said that Neo-ri represented the wavering 20-something kids. Q: Is GSY similar to Seo Neo-ri on the aspect of being a “wavering 20-something”? A: I feel that although I am very happy now, but I also have a lot of worries and there are a lot of things I need to overcome (haha). Because I really want to do well. Really want to perform well, although I am excited that I am able to chance upon this opportunity, but also have a lot of worries if I am able to do well or not. But you must tire and suffer while you’re in your 20s, only that way will it be better and easier when you are in the 30s and 40s right? Q: I heard that in order to prepare for the character you had actually enrolled in an announcer academy and even went to work part time in a sandwich shop. A: I thought of a lot of friends who were preparing to begin their jobs. In reality I also sough the advice of a friend who was preparing to become an announcer, so I felt that a lot of things corresponded (with real life). During my free time, I would attend the announcer academy, also for a scene in the drama during my free time I went to work part time in a sandwich shop. Q: In order to elevate her status, at the start she was determined to try anything in the start but in the end she chose to pursue her ideal boyfriend. How would Neo-ri live on from here? A: Whether it is Neo-ri, or her boyfriend as a part of society and fulfilling her own personal mission, I think she will probably live well. When gathered with people she seems happy. Although Neo-ri did not throw away all her greed, but those things are also slowly disappearing. Q: If GSY were Seo Neo-ri, what would she have chosen? A: I respect Neo-ri’s choice. I think she would have arrived at that conclusion after experiencing various things and mulling over it for a period, and it is a judgment that is completely in her interest. Q: Heard that the selection process for HITTG was very competitive. A: There were a lot of new actors that auditioned. 5 in a team at a time, so about 100 people. The audition started at 10pm, the interviewer in charge for my university admission test, Director Ahn Pan Seok actually still remembered me. He said to me, ‘that time you left a very strong impression’, shocking me. Q: Heard that you seem to have an affinity with Kim Kwon who plays the role of your boyfriend. A: We attended the same performing class in the past. When thinking of that time we talked about, ‘when will we be able to perform’ and went through our lines together, it was interesting and once more I felt that as expected there is such a thing as affinity. Q: In addition to your drama, you also gained a lot of public attention while being part of MBC WGM as well. You are really careful about WGM right? A: Because by itself WGM is a really popular program haha. I have also heard that there are also quite a lot malicious comments that come along (with its popularity). The fans have even helped to donate, so I feel really grateful. Q: Has things gotten more comfortable between you and LJH who is coupled as your partner? A: We are much closer. Although we first met in the program, but while filming it doesn't feel like a job but more like we’re out having fun. Thinking of giving my effort to try as long as we are able to film. It is fun because I am able to do things that I was not able to do before oppa. Q: Curious if between you both if sometimes you talk about stuff related to performing. A: Because oppa also wants to perform so with regards to what have we filmed, how did the filming go, how’s the atmosphere on site etc. we share with each other a lot of stuff related to performing. Q: Your teenage years was spent in a big entertainment company (SM) as a trainee. A: I started in the first year of junior high, and so I was a trainee for about 7 years. I had probably lived and worked even harder than my peers during my teenage years. I have regrets that I should have enjoyed my teenage years but was not able to do so. After school, I went straight to the practice room to train, went home to sleep and then went to school the next day… It was spent like that. But while performing I look back and also feel, I think ‘I think I was really well-behaved’ and and ‘my time was not wasted’ thoughts like that. Q: Then when you see your sister currently in cable TV’s Mnet’s ‘sixteen’ (Yoo Jung Yeon) it must feel really different from other people right? A: I cried after reading the note my sister left for me. While watching ‘Sixteen’ with Jung-Yeon, seeing that she had a hard time I also cried. If I didn't understand her circumstance I would think its normal, but because I was in her shoes before so I think it felt sadder. Q: There was a period you were had a hard time because you saw the friends you trained with debuting before you. A: I trained with the friends from FX and Red Velvet, I also entered late so I always thought ‘when will I be able to debut?’. Thinking if luck is on my side, it will one day come true, I think that was how I got through day by day. Q: Since you were a trainee for 7 years, your dance or singing skills must be really outstanding. A: Not at all haha. I have forgotten most of them now. When I first became a trainee, it was especially hard for me because I was tone deaf and clueless about dancing. I got by only because I thought I needed to do well. Q: What was the process like concluding your trainee life and changing companies to formally challenge acting? A: Before HITTG, I went to try out all the TV drama auditions that newbies could apply for. Among all the currently broadcasting dramas, I have auditioned for most of them haha. For twice a day, sometimes for one whole week I just kept going for auditions. Q: What are your thoughts about your recent attention? Q: After meeting you face to face, you seem and give off the feeling that you are very sensible. A: Regardless it has probably has to do with the fact that I am the eldest daughter that's why. Towards my parents and family I always want to treat them better. While filming HITTG, not only performance but I also learnt a lot on how to live my life. Q: Curious about the special reason behind the nickname “Bear SY”? A: Although I look like a fox, but I often hear that I am like a bear. That the overall feeling I give off is like a bear, haha. Q: Your personality seems to be the kind that is honest and straightforward. A: That's right. I’m also a bit slow. Q: For your next piece you have been selected by Six Flying Dragons. A: We will probably begin the first filming in July. Because it is my first time filming a historical drama I am really excited. Its quite interesting because she got married without falling in love, because she is unable to gain love is alone and full of hurts. Currently learning history, and familiarizing myself with the tone. Q: Do you have an actor you really like or a role model? A: I have really liked Senior Lee Young-Ae since I was young. I want to possess her kind of beautiful, elegant and honed disposition. For foreign actors I like Rachel McAdams. Q: What are your plans for the upcoming half of the year? A: Firstly to put my all into Six Flying Dragons, if there is a chance I would also want to try movies. Q: Curious about your thoughts on genres you want to try. A: I really like horror movies. On one hand although I am really scared, but I want have a lot of thoughts on challenging detective dramas. If presented with a suitable opportunity I also want to try an action film. “ I really want to become an actor. Before I even cried and told my company, ‘Please let me get busy’. Now I endorse a makeup brand as a model, am doing a variety program, and am filming a television drama, my days go by busily. I feel comforted inside knowing that I am able to do the performing that I wanted. Most importantly I am able to repay my parents who have silently supported me while I was a trainee for 10 years, so I am really happy. Even though I am busy and its hard, I only feel happiness”. GSY spent 7 years as a trainee to be a singer in a well-known entertainment company, after turning 20 she decide to become an actor. Although she took part in a lot of auditions, but things did not go as she wished. While feeling mentally exhausted, she pulled herself together and challenged an audition again, this time earning herself an entry ticket to HITTG. Auditions are usually carried out very quickly targeting 10 people at a time. GSY’s many years of auditions honed her technique, it was her freshness that allowed her to stand before the director in charge of HITTG Ahn Pan-Seok. She received a pass for the audition and finally earned the label of an ‘actor’. Through HITTG GSY who is in her 20s presented a youthful image. She played a character Seo Neo-ri who was momentarily tempted by the life of the upper class, and having experienced a crises, a character that returned to reality once again. During the first part of the drama, as an aspiring announcer she personally took on part time jobs to earn her pocket money. If we are to talk about the similarities between GSY and Seo Neori, it would be that they both have a lot of experience working part time jobs. Since she was 20, GSY started to work because she did not want to ask her parents for money. As the oldest among 3 daughters, she has worked in a hotel as a buffet server. While working she experienced many things that left her at a loss unable to laugh or cry. Thinking back on those days, she revealed a smile. After HITTG successfully ended, GSY is scheduled to be part of the upcoming SBS drama SFD for broadcast in October. SFD is a drama that tells the tale of the 6 dragons Lee Bang Won, Jeong Do-Jeon, Lee Seong-Gye and fictitious characters Lee Boon Yu, Moo Hyul and Boon Yi who laid the foundations of the new nation. GSY plays the character of Taejo’s concubine, Min Da-kyung who eventually becoming Empress Yuan. Empress Yuan was a crucial character in helping Taejo ascend the throne, and she had also a desire to ascend to the highest position among women. Thanks to her father who is a fan of historical dramas, GSY who has also paid attention to them, and had handed the director her thoughts regarding Empress Yuan during her audition, revealing her passion for the character. As the interview comes to a close, GSY expressed that that it is her dream to become an actor that abides by what she has to do. She even said, “ As Yoo Seung Yeon I will become a strong person” revealing her enthusiasm. “To believe in myself and be a person not easily moved, also it would be even better if I am able to become a person that gives off her own fragrance”, She laughed while explaining. Now is the start of her bright future. Variety, TV drama, new actress GSY while having in hand the drama scene is simultaneously becoming a hot item. After the recently concluded drama HITTG, GSY is scheduled to be part of the upcoming SBS drama SFD for broadcasting in October. Not only that, GSY is also paired up with Idol boy band CNBLUE member LJH as a virtual couple full of chemistry in MBC variety WGM. Entering the entertainment industry with the label “SM trainee”, GSY recently sat down with Herald POP in an exclusive interview where she spilled on secrets from her trainee life to her audition process, her future plans and various other stories. Unlike her fox-like outer appearance, throughout the interview she reveled a side that was constantly easy going and mature. GSY still remembers the contents of the letter that she handed to the director during the audition. Regardless, simply meeting the director I felt that it was such an honor, even if I couldn't be casted, I looked forward to the day when I could see him again. In reality, before GSY’s HITTG successful audition, she had failed a hundred other auditions. Towards GSY who felt a sense of defeat and setback, HITTG has become a very meaningful piece. GSY also expressed that it was due to her appearance in HITTG that she was able to be casted in WGM and SFD. The WGM PD, Sun Hye Yoon, had offered SY an audition for WGM after seeing SY in a few scenes in HITTG. After falling hundreds of drama auditions, SY went for the audition not expecting much and just went for the WGM audition, but it was that free and unrestrained appearance that captured the heart of the PD. SY herself had thoughts like " 'How did she know about me? They're not going to use a newbie like me right? Amazing.' Although it was a very important occasion, but I had a very light-hearted mindset. For my outfit I wore my favourite denim jacket. When they told me they wanted to carry out an in-depth interview, I simply wore my denim jacket with my checked shirt, answered the questions truthfully and went back home. After that, they told me that it was because during that portion I gave off the feeling that I was just like an average female college student and so they felt it was good (haha)". With filming for SFD just around the corner, GSY also revealed that there is a ‘rumor’ behind her casting. It turned out that the director of SFD, Shin Kyung-soo, is a passionate fan of HITTG. Director Shin had also offered GSY an audition after seeing her appearance in HITTG. As the interview went on, compared to talking to an actress, GSY felt more like a “really good friend”. This made us look forward to her future. Finally we asked her how she would like to be remembered as an actress. “I want to keep appearing be productions, and want to be an actress with good actress, a beautiful actress. Please look forward to SFD”. The July 18 episode of MBC’s “We Got Married” featured Lee Jong Hyun and Gong Seung Yeon’s wedding party with friends. The couple also read personal wedding vows to one another. The couple’s jealousy concerning Suzy and Yeo Jin Goo made everyone laugh. GSY, newbie with hidden qualifications. As a newbie, actress GSY’s appearance has shattered prejudices with true sincerity as demonstrated through her abundant views on acting. Actress GSY (22) from her CV is shown to have entered her 3rd year since her public debut. It was only recently that she formally gained recognition from the public. Some people will have simultaneously with labels such as “newbie” and “one shot to fame”. But her one shot to fame had actually took a long time where she took step by step silently. “They think that the reason why I came out of nowhere suddenly was because I had a background sponsor, and I had actually seen such comments. It was nothing like that. Up till now, I have gone through over 100 competitive auditions, to be able to be selected in SBS’s HITTG and MBC’s WGM. I had also spent a long time as a trainee, so it is not the case that it is a “one shot to fame”. Unpretentious, keen-witted charm was the reason why GSY passed the audition for SBS’s HITTG, with her voice and obvious charm. Recently, during the Fact’s reporting team meeting with GSY, she expressed that although HITTG has concluded its run, but the excitement she has for the filming site is still there. Her next work is scheduled to be broadcasted in October, SBS’s Wednesday/Thursday Drama Six Flying Dragons, from script reading to the final production every step is filled with happiness for her. GSY expressed that she has her worries too but she is the type to endure them alone. In the drama, GSY played the role of Seo Bom’s sister Seo Neori. Seo Bom was able to upgrade her status through her marriage with the son of a conglomerate, and so she was a character that struggled a lot because while she was jealous and envious she had also wanted to gain her chance through using Seo Bom. Although she was not an antagonist, the audience did not like her. “On site, when I read the script, I often heard people say “Seo Bom, be more sensible”. Seo Bom’s position is understandable. No matter what, for a good opportunity to suddenly present itself will lead to confusion. Just like Seo Bom, easy going and not feminine enough. My personality is such that I forget things right away. Originally I am more introverted, but when performing it changes. As for other aspects, Seo Bom is speaks whatever is on her mind, and the fact that she doesn’t beat around the bush is enviable. If something is troubling me, I am the type to keep it to myself”. What was the reason for becoming an actor? The dream of being on stage. GSY habours the dream of standing on stage under the camera lights and around a team of staff. Although GSY is introverted, after starting her activities in the entertainment industry has taken more initiative. Passing the audition during her sixth year of elementary school, she took a camera test without knowing what she was in for when signing up with an entertainment company. With one leg in, her dreams to become an artist was cultivated, and although she was still young the desire to walk down this path was strong. “ When I stood on the stage during the youth best competition, although I was young, but having been applauded for, I was happy. Although I was preparing to become a singer but changed paths to become an actor. With the cameras in front of me, and being surrounded by staffs, and to be able to stand on a prepared stage, hearing ‘ready, action’ and under the camera lights, all these filled left me with a lot of dreams”. GSY’s real ideal type? GSY suggested that sincere and a guy with a sense of responsibility is her ideal type. GSY’s name cannot be mentioned apart from WGM season 4. As a new actress the fact that she was selected for WGM, had brought about a lot of talk and gossip, as such her every response was especially careful. Even though it is such, the harmonious atmosphere on site and her good mood cannot be concealed. GSY’s remaining mission. GSY has a lot of hopes for acting and is determined to challenge it proactively. GSY expressed that just like current SBS’s Wednesday/Thursday Drama “Mask” Sooae, her dream is to play a character with two personalities. Through her success with HITTG she is successfully moving along the path of an actor, just like what she has shared, compared to being burdened, she has the mindset of challenging things. so proud of her.. she will growth as a great actress.. I knew it..
maybe she will pass her role model 'Lee Young Ae"
but not like Lee Young Ae, who choose to stop acting after getting married.. I hope SeungYeon will continue to act even though getting married later.. In the midst of liveshooting culture practiced in Kdramaland, the team behind the upcoming SBS drama Six Flying Dragons has already started filming, four months prior to its premiere scheduled in October after Mrs Cop. It’s a common practice for the team since they also did the same with Tree with Deep Roots: securing the cast and kicking off the production early to maintain the quality of the drama. We also get more news on the additional cast and I’ll continue updating this post with the new ones. Ah, it’s so hard to wait when I’m so excited for the drama! The main cast undergoes major reshuffling regarding the main actress: Baek Jin-hee has bowed out from the project and Shin Se-kyung is then confirmed to join the sageuk as Boon-yi. It’s not surprising since she worked with the team in Tree and did a decent job there as So-yi. Hopefully her character will showcase more of her charms after her performance in The Girl Who Sees Smells. Jung Yoo-mi has chosen to act in sageuk again after Maids, but it’s only recently she has confirmed to star as Yeon-hee, a woman who received the affection of two men: Jeong Do-jeon and Ddang-se (Lee Bang-ji). Her character caught the eyes of Jeong Do-jeon but at the same time, Ddang-sae, who was her first love, appeared in front of her. Well, that’s awkward. Yeon-hee will be the only woman supporting the first Prime Minister of Joseon to lead the founding of the new dynasty. Gong Seung-yeon has signed up to play Yi Bang-won’s wife, Min Da-kyung/Queen Wongyeong. She gained her popularity through the hit Mon-Tue drama Heard It Through the Grapevine as Go Ah-sung’s sister, Seo Noo-ri. I’m excited upon hearing her casting because Queen Wongyeong was also a key figure behind Bang-won’s ascension to the throne, and the actress made the decision after PD Ahn Pan-seok encouraged her to do so since she will be able to act alongside Yoo Ah-in. Min Da-kyung is described as a female version of Yi Bang-won: they were so similar to each other and that is probably the reason why she fails to capture her husband’s heart. Nevertheless, she will be supporting his every move towards his rise to the top position in the dynasty. Lee Cho-hee is going to be reunited with Jung Yoo-mi here after her stint as In-yeob’s faithful servant in Maids but this time, she is playing a street singer and performer at the marketplace who lost her mother tragically when she was young. She will become an aide to Ddang-sae. Ddang-sae sure has a lot of ladies in his life! Maybe Byun Yo-han is fated to play ladies’ man in dramas? Sageuk veteran Seo Yi-sook (whose recent works include Empress Ki and The NIght Watchman’s Journal) joins the cast as Mu-hyul’s grandmother, Myo-sang. She will be a commoner who has witnessed the crumbling of Goryeo Dynasty and the founding of a new nation under Yi Seong-gye. She raises her grandchildren in an ordinary setting but used her experience to guide them in their lives. Park Hyuk-kwon will be having some sort of a reunion with Yoo Ah-in after Secret Love Affair, but it’s still unknown whether they will share a scene together. He plays a swordsman serving under the Goryeo official Yi In-im named Gil Tae-mi, but he has a fatal weakness that is his attraction towards beautiful clothes and ornaments. That’s rather peculiar for a swordsman and it will be quite a feat to see a swordsman sporting colourful attires when he’s supposed to look tough all the time. For fans of Alcheon in Queen Seondeok, this will be a good news for you guys: Lee Seung-hyo has signed up to play Yi Bang-woo, a Goryeo loyalist. The last time I saw him was in Full House Take 2, in which he became No Min-woo’s manager. The news articles didn’t mention it but I think he will also become the firstborn son of Taejo and eldest brother of Yi Bang-won, known as Grand Prince Jinan who hid himself and his family after his father overthrew Goryeo Dynasty and founded Joseon. Now that they have started to cast the princes, I can’t wait to see who will nab the roles of the other royal sons! The younger version of the main characters have started filming the earlier portions of the story, and the cast is slowly revealed: we got the talented Nam Da-reum as young Bang-won and Lee Re as the young Boon-yi. not sure whose younger version Yoon Chan-young will be portraying in the drama, probably as young Ddang-sae? Kim Hak-sun, the butler in Heard It Through the Grapevine, is reprising his role as a butler but in a different setting: he will be serving Gil Tae-mi’s household inDragons. I bet Director Ahn Pan-seok plays a big role in suggesting the actors who worked with him in his dramas to the production team of this drama! Oh, remember the young married intern with a baby who made Manager Oh (sort of) profess his love for Geu-rae in Misaeng? The actor, Jo Hyun-sik, is joining the fellow Misaengalumni Byun Yo-han in Dragons as a beggar. I’m not sure if it’s just a short cameo or his character’s there to stay. Jeon Sung-woo, a musical actor, is making his small screen debut through Dragons as a Sungkyungwan scholar. Last but not least (for now): Seo Joon-young has agreed to make a special appearance in the drama as Bang-won, Ddang-se, and Mu-hyul’s sworn brothers. His character will play an important role in setting up the story, but that sound ominous. Ehem. He worked alongside the team in Tree as Prince Gwangpyung, and I REALLY hope that his character here won’t meet the same fate as his previous characters in SBS sageuk. Don’t you dare to pull the same trick on me after what you’ve done with Heung-bok in Secret Door, SBS!